PT Elnusa Tbk - Elnusa is a reputable upstream oil and gas services company in Indonesia. 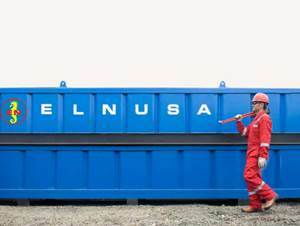 Elnusa running business in seismic survey, drilling and oilfield maintenance. The Company also has supporting competencies in the field of energy distribution and logistic, marine support, fabrication and data management. Elnusa was first established on 25 January 1969 and originally founded under the name PT Electronika Nusantara. The name PT Elnusa was launched on 9 September 1969. Elnusa was officially listed at the Indonesia Stock Exchange (IDX) on 6 February 2008 and its shares are traded on IDX under stock code ELSA. Currently, Elnusa is 41.10% owned by PT Pertamina (Persero), 17.81% by Pertamina Pension Fund and 41.08% by public. Elnusa is based in Jakarta and now has 8 subsidiary/affiliated companies; PT Elnusa Geosains Indonesia, PT Elnusa Oilfield Services, PT Patra Nusa Data, PT Sigma Cipta Utama, PT Elnusa Fabrikasi Konstruksi, PT Elnusa Trans Samudera, PT Elnusa Petrofin, and PT Elnusa Patra Ritel. In term of financial performance, Elnusa registered total revenue of Rp 3,775.32 billion in 2015. This figures was down 10.56% as compared with Rp 4,221.17 billion in 2014, primarily due to lower oil prices. The Company's comprehensive income for the year 2015 amounted to Rp 375.83 billion decreased by 8.34% compared to the year 2014 amounted to Rp 410.05 billion, according to PT Elnusa Tbk Annual Report 2015 as cited by JobsCDC.com. Minimum Diploma Degree majoring in Mechanical Engineering, Electrical Engineering. Minimum 2 years of experience as mechanic or similar position. Have supporting certificates is a big advantages. Willing to be placed in Tambun Bekasi area. Contract based position for 7 months. Minimum High School or Vocational High School. Minimum 3 years of experience as Slickline Operator in oil and gas company. Possess well control certifications such as IWCF, IADC is a big advantages. Possess certification in slickline specialist level 1 and 2. Have sea survival certification than still valid. Willing to worl at all over company sites. Minimum 5 years of experience as Slickline Chief Operator in oil and gas company. Possess well control certifications such as IWCF, IADC is mandatory. Possess certification in slickline specialist level 1 and 2 is mandatory. JobsCDC.com now available on android device. Download now on Google Play here. Please be aware of recruitment fraud. The entire stage of this selection process is free of charge. PT Elnusa Tbk - SMA, SMK, D3 Operator, Chief Operator, Mechanic Elnusa July 2016 will never ask for fees or upfront payments for any purposes during the recruitment process such as transportation and accommodation.